Manchester United striker, Zlatan Ibrahimovic is ever closer to a first team return as he has been undergoing some gruelling workout sessions at the United training base, Carrington. 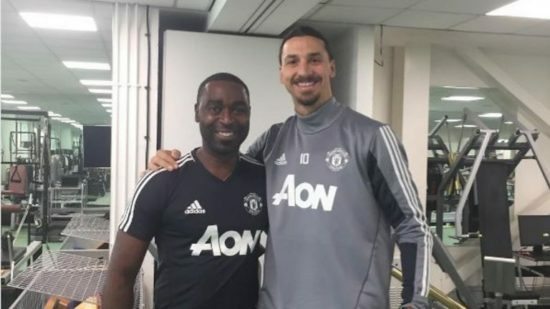 The 36-year-old striker was pictured in the gym alongside Old Trafford icon, Andy Cole who himself is recovering from a kidney transplant. Ibrahimovic has been out injured since April this year, suffering an Anterior Cruciate Ligament injury that threatened to end his United career for good. Below is the picture that Cole shared on Instagram. The former PSG man became a fan favourite after arriving at Old Trafford last year to reunite with former boss, Jose Mourinho and he had an immediate impact, scoring the winner in the Community Shield victory over Leicester and netting twice in the EFL Cup Final against Southampton in February. His return is seen as another boost to our club given that his replacement, Romelu Lukaku has hit the ground running at the club, scoring 11 goals in his first 10 matches. Despite Zlatan regularly sharing updates about his return to action, United boss, Mourinho has claimed he won’t be rushed to action, giving assurances that the charismatic Swede won’t play until after the New Year, as advised by his doctor, Freddy Fu. Zlatan signed a new contract despite picking up the serious injury last season, albeit on lesser wage terms. Zlatan is a physically imposing striker known for his clout, class, enduring finishing and extraordinary fitness levels even at his age. He scored 28 goals in 46 matches for United last term, and has taken up the challenge so as to finally win the Premier League and keep his critics quiet.